If you've been reading my blog for a while or you watch my You Tube videos you'll already be fully aware that I suffer from oily or greasy hair, I never had a problem with greasy hair until I had my youngest daughter, and I think a change in my hormones must have had some sort of effect on my hair and I started to suffer quite badly with greasy roots and needing to wash my hair on a daily basis. Anyway I digress (as usual) over the past few years I have tried so many different dry shampoos I have become a bit of a connoisseur and up until a couple of years ago when it was discontinued, my all time favourite dry shampoo was the Charles Worthington Balancing Act, which can still be purchased from e-bay (link here) but is expensive. So since the demise of the Charles Worthington I have been on the hunt for another holy grail dry shampoo. As I said I have tried so many different dry shampoos it's ridiculous and a few months ago I discovered the Dove dry shampoo and I fell in love with it, it didn't leave any powdery residue and my hair didn't feel too gross either, is it me or does anyone else hate the way dry shampoo leaves your hair feeling? A few weeks ago I was in Boots with Simon and I needed to pick up some hairspray and also a shampoo one of my subscribers had recommended to me (more of that to come on the blog soon) hair care was on a 3 for 2 promotion, so I picked up the shampoo and hairspray and thought I'd pick up some of the Dove dry shampoo I like but then I saw the Pantene Dry Shampoo and was curious, I'd never seen it before and thought I'd give it a go since it was a free item. There were 3 different types of the Pantene dry shampoo, the Colour Saviour, Instant Refresh and Volume Booster, I chose Colour Saviour as the name intrigued me. My initial thought when I first used the dry shampoo was that it smelt really nice, it smells like an expensive hair product or a hair product you'd find at a salon if that makes sense? I used the dry shampoo as directed and found it didn't leave my hair looking white or grey it brushed out well but my hair didn't look greasy, on first impressions I was impressed. Overall I do really like this product and it does exactly what it says on the tin, well maybe not the colour saving thing but hey ho, but it does make my greasy hair look refreshed and not greasy, and it doesn't leave any kind of white or grey powder in my hair giving me that old lady look some dry shampoos can give. It smells lovely too which is a bonus and you don't need to use a lot. It does leave my hair feeling like it has product in it because it does but it doesn't leave it feeling really gross and if you wanted to use the product to give your hair some texture this would be great, it gives me a lot of volume and texture when I've used it but I do use it mainly for my greasy roots problem. Overall I am really impressed with it and would definitely re purchase it. I just wish it was cheaper as I thought £3.99 for 180ml was a little expensive but like I said I didn't need to use a lot so swings and roundabouts as they say. The only bad thing, apart from the price that I found about the product and this isn't really the product but the packaging was when I had just under half of the dry shampoo left, my spray nozzle broke and I couldn't press it down anymore meaning I couldn't use the dry shampoo any more either, so I was left with almost half a can of dry shampoo that I couldn't use. I did ring the customer care number on the back of the can and the lady I spoke to offered to send me a voucher to reimburse me for my purchase which she did and a £5 voucher arrived a few days later but I was very disappointed in the packaging for that reason, but it hasn't put me off buying it again, just something I feel you should know, as you know my reviews are always 100% honest so I wanted to let you know about that too. But broken nozzle aside, I really do like the Pantene dry shampoo and would recommend it if you are a regular user of dry shampoo for the texturising properties or because like me you have greasy hair, it combats both issues really well and smells great, I would just rather it be cheaper but I guess a girl can't have everything can she? 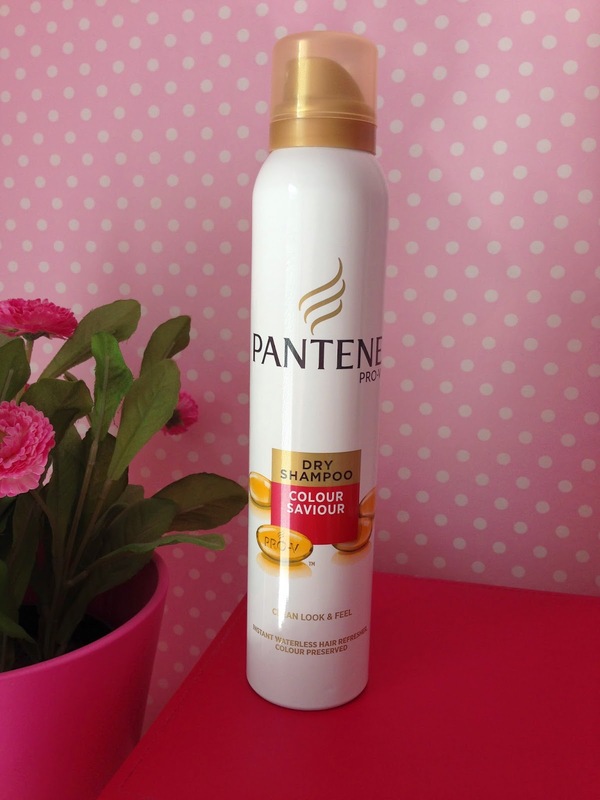 Have you tried the Pantene dry shampoo? What are your thoughts?